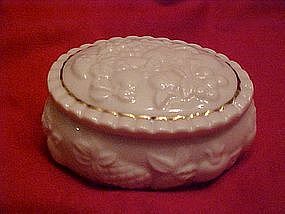 Creamy colored fine china trinket box by Lenox. dated 1998. Oval box with lid has an all over fruit design with a simple gold trim. Measures 2 1/2" by 3" and is about 1 1/2" deep. Like new condition, just perfect.